"Touched by an Angel" was a popular TV show back in the late 1990's. Greg and I used to watch it every Sunday evening. We always loved the part of each show when the angel Monica would tell the person how much God loved them. John Dye played the part of Andrew, the death angel. He had such a kind face and was the the one who would take the person to heaven when they died. Although I enjoyed the show, I had one problem with it. They spoke of God's love but never finished the message. I wanted them to add the Truth. Yes, God loved them. He loved them so much He sent His Son Jesus to pay the penalty for their sins. But they needed to receive that gift personally to receive eternal life when they died. But this is TV! 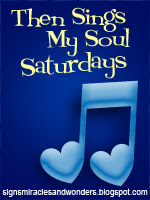 I had listened to the song "Testify to Love" in my car this week and had written it down as a reminder to post for "Then Sings My Soul Saturday". This song was sung by Wynonna Judd in an episode about a little boy named Petey who was dying. This morning as I was sitting at my computer to write this post, I clicked on KLove. That's the radio station I often listen to on my way to work. In the section titled "In the News: Most Clicked Stories", one headline caught my eye. It read 'Touched by an Angel Star Dies'. 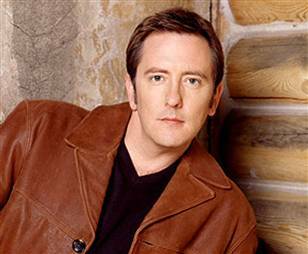 I quickly hit the link and read that John Dye, the actor who played Andrew, died of a heart attack at the age of 47. I remembered the trip Greg and I took to San Francisco with my nieces Kristin and Katie. We were having brunch in a hotel restaurant. The girls were loading their plates with food when they came running back to our table to tell us that the angel Andrew was there! It was John Dye who was having brunch with some friends. They wanted to go up and get his autograph but we didn't want to disturb him. But I have to say he did have such a sweet face. How sad that he died at such a young age. I was planning to post the Avalon version of "Testify to Love" but changed my mind after reading of John Dye's death. Here's Wynonna singing in the episode I mentioned. Very sad to hear that and yes so young! You are such a blessing Debbie! Thank you for sharing this. WE lost four members of our small church during Christmas. It is comforting to know that they are in the loving arms of Jesus. I didn't know this Debbie, and it makes me sad too. We used to watch that show also. I really hope he had found Jesus. So sad to hear this about "Andrew." We just never know when this life will end. I' pray he knew the truth. Have a blessed week, Debbie. I had seen he has passed at an early age...so sad. I used to watch that show every time it was on. Sorry to hear he passed away. So sad to die so young. This is the second unexpected death I learned of this week. There is an old saying, "Plan as though you will live a hundred years, but live as though today is your last day. Only God knows when He will call us home, but I want to be ready. Just watching this video made me cry. I never watched the show when it was on, but I always heard how good it was. My sister said this week that her "angel" died and now I understand. Thanks for sharing this info and the song, Debbie. May we all testify to His love AND truth today! I loved that show too. It was so good. I wish they had more shows like that on now. I was very sad to read of John's death. He was so good in that role. Well, that just brought chills to me and so many fond memories of that show. But, like you, I always thought it was an unfinished story. Had no idea John died, so hope he is safe in the arms of our Savior. This was one of the few episodes of this show I watched a short while ago. Watching this made me cry... I remember the significance of this song and this moment. Love this song! I love the video of her singing. I love the song, Testify to Love. I think the song saids it all. I may have watched this show once. Enjoyed this clip. I love this song by Avalon. At our old church this was a favorite of the youth choir. Once more I find myself crying after watching Touched by an Angel. I agree, I missed the message about Jesus, I still do. But I heard the last words young Peter said to Andrew, " Is it finished now?" "Yes, it is finished," Andrew replied. And that was our Saviour final line as He died upon the cross at Calvary. I just cannot tell why this series touched me so deeply. A story about God's love beyond understanding. I also feel I learned to know another and more profound side of America, from the slums to the castles. People struggling with universal problems embracing the love of an ever loving God. I like to think this is the real America. Thank you for posting this, Debbie. 47 is so young, and I pray that He did know Jesus. Also, that's a beautiful song. Let's all testify to Love! Great song and it was a wonderful program. As I tell my family so often death has no age and we need to make sure we're ready to die no matter how young we are. I clearly remember watching this episode and just crying! I heard that he had passed yesterday. Very sad. This song is fantastic though! as Savior. I loved that show. T.V. movie, "Jesus of Nazareth"
a gay man and then a killer. I have only learned about the show when I heard about this man who died. Just a reminder how fleeting this life truly is and for a lost world not to know about the Good News, that's even more loss. I use to watch that show too Debbie and I had the same thoughts as you. The show lasted longer by mentioning God because "He" could have been "he/god" from another religion. The Name of Jesus is the One who offends. I always hated they left Him out of the show. I'm so sorry to hear that he died so young. I pray he knew Jesus. I'm sorry I don't visit often. I think of you! My husband and I loved watching the show and are saddened by John Dye's death. I do hope he knew Jesus. I also didn't like the fact they didn't mention Jesus and tell the whole truth. I do remember one episode - in fact it was a follow-up show with Wynonna after Petey died. At the beginning of the show Tess told Monica that God understood because He also lost a son. That was the closest to mentioning Jesus that I'm aware of. Thanks for sharing this video today. That was one of our favorite episodes. I agree with Beth...I also pray that he knew Jesus! Such sad news to hear he died. portion from this show. I agree with you that they should have taken God's love further, but each week, I was "Touched by an Angel"! I don't know much about the actor John Dye, but if he was my angel of death, I'd go happily. I pray that he knew Jesus and now celebrates in heaven. But this episode of Petey stayed with me long after it aired. None of us know our hour and this is very sad news to me yet I will rejoice because this is the day that the Lord has made and you came to visit me, even though it was my team blog (and I even forgot I posted there). My other song is from Jason Upton at aMazing Grace. I hope you don't object but I'm adding your link so more hopefully may come and TESTIFY of His love and aMazing Grace! Wow, I had forgotten about the show and the angel. How tragic, he was so young. I am moved to tears by the song. I have never heard her sing it. Lovely. Thank you for sharing this song. I wish you a blessed week. I am saddened by the death of this young actor. 47 is so young. Early deaths, like this one, always takes us by surprise. Your post here is beautiful. WOW!!! This is very sad to hear, especially when he was so young. I so pray that he had a relationship with God. love the song, debbie. it's beautiful!